My post about functional ear training has been quite popular. I’d like to expand on it and show you some additional strategies to get the most out of the free software. If you haven’t read the first post, please do so now. 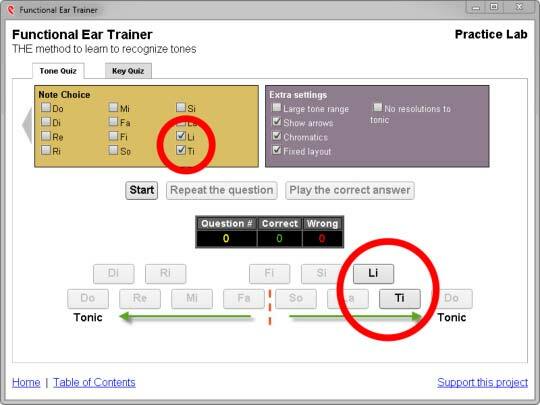 It covers a general overview about functional ear training, where to download the software from, and your first steps with this method. Before we get to the 2 additional practice strategies to master chromatic notes, please make sure that you can deal with the basic major scale first. The major scale is the most fundamental scale used in western music. You really need to nail that sucker before moving on to chromatics. Fortunately, it’s not that difficult. You just need to learn to recognize the sounds that you have been exposed to pretty much your whole life. It’s not something completely strange or foreign to you. 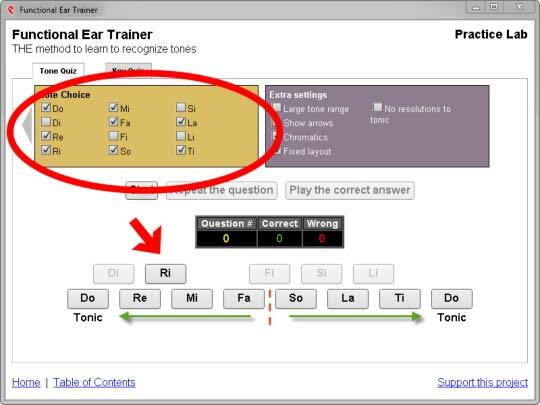 The basic training program that’s built into the functional ear training software does a good job with breaking it up into manageable steps. It’s a good idea to focus on the lower half of the scale first, before tackling the upper part. With only 4 notes it’s faster to tune into each note’s “personality” and get a feel for the sound. And don’t worry if you are somewhat guessing at first and you go by a sense of high- or lowness when answering the questions. That’s more than ok in the beginning. It won’t take long until you’ll start to hear that “personality” sound I’ve been referring to. You’ll start to notice the difference in sound between e.g. the 3rd degree and the 4th degree of the scale. It’s a certain characteristic that’s independent from the actual pitch – meaning, it doesn’t matter what key it’s in. You could be in the key of Eb and hear that 4th degree sound and therefore it has to be an Ab note – yet when you are in the key of C, that same 4th degree characteristic sound lets you know you’ve just heard an F.
Instead of overloading your ears go for 1! chromatic note at a time. Here, in this screenshot you can see that I’ve added the minor 3rd to the major scale. Another strategy is to focus on note pairs. Compare the basic interval sound with its chromatic counterpart and focus on that exclusively. Here’s an example of the major 7th/minor 7th combo. compare the tritone (Fi) to either the 4th or the 5th. All those individual practice sessions will pay off big time when you go for the complete chromatic scale. It’ll give you a fighting chance and, when you get better and better results, will improve your motivation for even more practice sessions. Here are 3 more practice approaches that really helped me a lot. 1) Think about each quiz. Use the repeat button as often as needed. 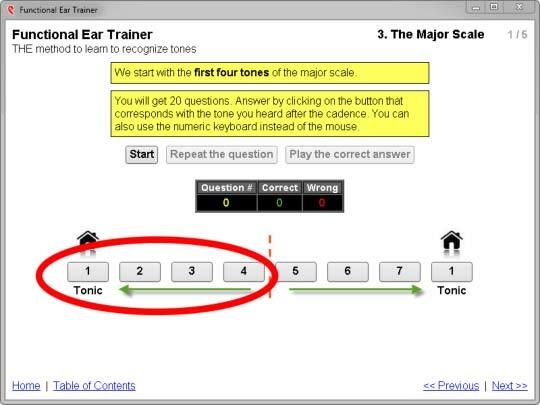 Sing the note and work out the way up or down to the tonic. Only answer when you are 100% sure of the correct answer. This approach is a great way to drill in perfection. 2) Again answer only when you are 100% sure of the answer – but this time DON’T use the repeat button. You are only allowed to replay and work out the question in your mind. A great way to strengthen your aural recall abilities, your inner ear. 3) No replay and no thinking. Answer as fast as possible. If you are wrong, you are wrong. That’s part of the process, too. This will prepare you for real life application. Let’s face it: there’s only limited amount of use if it takes you 3 minutes to figure out that you just heard a minor 7th. By that time the rest of the band already is playing the next song. By going for speed (even if it means more mistakes) you’ll train yourself to analyze quicker and develop better musical gut instincts. Combining these 3 approaches will help to develop a fast and laser-sharp ear. Thanks for this useful post (one more !) 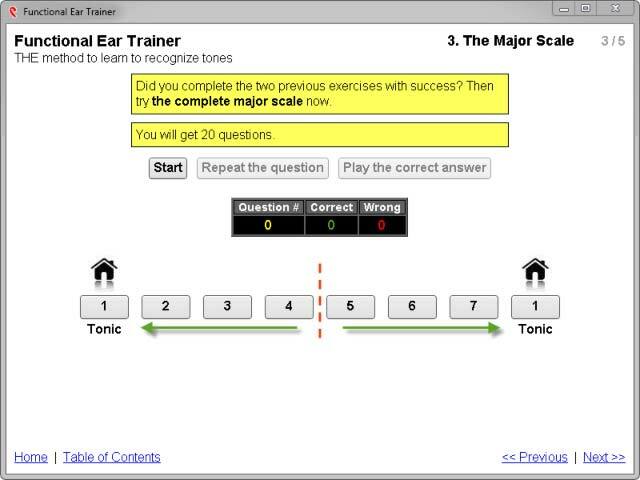 about ear training… Your strategies are great, and I’m going to follow them right now. Practicing the chromatic scale is mandatory, of course, but I actually wonder what are the next steps in order to experience real life benefits. I’d like to hear your thoughts about that ! On a side note, I’d like to mention two iphone and ipad apps that are really useful to practice on the go : Solfi Ear Trainer Pro and Do Re Mi Ear Training. Both generate random melodies in the scale you choose. Ah, the real life benefits – and how to (finally) get them. I know exactly what you are talking about. It’s very common to “work up” your score in programs like Functional Ear Trainer to the 95-100% range and still feel tone-deaf when listening to “real-world” music. In the meantime keep on doing what you are doing. 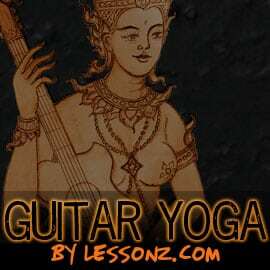 Random melodies, functional ear training, iPhone apps for practicing on the go… sounds like you are already doing lots of different, beneficial activities. Thanks for the comment and the link/recommendations for the additional ear training resources. Can’t have enough of those to keep the training interesting. Thanks for your answer – I’m really looking forward reading your post about achieving real life goals ! If you allow me some more practicing ideas, Performance Ear Training by Donovan Mixon contains some very good devices for blending ear training into real life jazz (stuff he calls Harmonic Bass Lines or Tendency Tones) ; and virtual practice, as described by BobTaylor in his Art of Improvisation books (http://www.scribd.com/doc/35301061/Guitar-Book-Bob-Taylor-The-Art-of-Improvisation-Teaching-Improvisation, not sure the link is legit), plays also a great role for connecting musical imagination, technical skills and ear. Thank you for the compliments. I’m really glad that this is helping you out. It’s a common mistake to take on too much at once and to overload your ears. Make sure to take your time and let your ears develop. But with the major scale mastered, you already have a great foundation to build on. All the credit for the software belongs to Alain Benbassat. Thanks for the support – he deserves all the donations for creating such incredibly useful software and making it available for free. Hey there!! Someone suggested that I use the older version you have chromatically right off the bat along with it unchecking the octave and keeling it in C Major only. I feel it’s too much, but I want to do what’s right. I like your approach on using version 2 and breaking it down, but I’m not sure if I should listen to my buddy or go with my gut and use version 2. If I did use v2, what would be the settings you would recommend for very untrained ears. Should I do multiple octaves or stick to C, and should I do C only or all keys? There are so many articles on how to train your ears, I’m confused and don’t know which way to go. Do I use this functional ear training method solely, or should I do other things like singing intervals at the keyboard and use iPhone Ear Trainer apps, or leave them out of the picture? Some people say they help, others say they are detrimental to your training functionally … I’m just really confused 🙁 Thanks!! The best ear training is the one that you consistently do over a longer period of time. From my experience, starting off with all 12 chromatic notes is just too much. It’s “sink or swim” – if you suddenly learn to swim, that’s great. But it’s more likely that you just sink instead. You can’t force your ears, you need to develop the skills over time. Your 1st goal should be to get into the habit of daily ear training. Don’t go crazy on yourself and schedule 30 minute sessions. That’s really hard to sustain. You get tired and/or frustrated quickly and lose interest. Do a 5 minute session. If you really want to go for it, do a 2nd 5 minute session in the evening. That’s it. Go for the consistency and the rest will follow in time. It’s not just about keeping it easy for the sake of keeping it easy and having fun. Although, that’s a nice side effect. It’s actually quite useful when your ear training session can be fun. It’s about building a solid foundation in order to truly progress. So start as simple as you need to. Learn to hear the lower 4 diatonic scale notes first ( Do, Re, Mi, Fa) then switch to the upper tetrachord (So, La, Ti and Do again). Then combine the 2 groups into the full diatonic scale. Stay in 1 key and 1 octave initially. My personal benchmark always was to hit the 90%+ for at least 3-5 days in a row. Once you have a solid grasp on the full diatonic major scale, you can start to increase the difficulty by expanding the octave and then by switching the keys randomly. If you have the feeling that another method confuses you, it’s probably better to just stick to your main method. Once the dust settles, you’ve gotten into the habit of regular ear training and you are having your first successes (as small as they may seem to you) then you can still expand your ear training exposure. I’d like to know how to download the new version with the option to isolate the individual chromatic tones. Ah, thanks to your question I just noticed that I didn’t include a link to the software download in this post as well. It’s only in my 1st functional ear training post. Sorry about the inconvenience. I’ll fix it right after finishing this answer. Yes, it very much helps to put the concepts of “First Steps to Ear Training” into practice. I remember this little book very well. Way back, a long time ago that book was my 1st taste of solfege and a welcome alternative to all the “learn your intervals in isolation” exercises I’ve been urged to do at that time. The program recommends initially that you sing up or down the scale to resolve it. What are you supposed to do when you add chromatics? Do you sing that initial half step then keep going or do you abandon the singing altogether and just hear the character of the note (and hopefully not resort to interval recognition songs)? Thanks! I think it depends on how many chromatic notes you add. If you add them all, it definitely is a good idea to sing the initial half step (and then the remainder of the scale,) since that gives you a more immediate “feel” of where you are in the scale. And with practice you’d stop relying on singing and you’d just hear the note character by itself. At that point you can abandon the singing in favor of simply knowing. Personally, I tried adding all the chromatics at once, but it didn’t work for me. It was too much at once. Once I focused on recognizing one chromatic note at a time, I progressed much faster. So that’s what I recommend. Make sure that you have a solid grip on the diatonic major or minor scale first. Only when you’ve accomplished that add a single chromatic. That chromatic note character will stick out and since it’s the only one you’ll know which chromatic note it is. This really helps to not only recognize that particular “sound” but it also develops a psychological sense of certainty and trust in yourself. And when you have rotated through all the chromatics individually it will be a lot easier to get that final fine-tuning in so you always recognize those notes and it will be a snap judgement without singing or some other kind of trick. I hope this helps. If you have any additional questions, feel free to ask. Thank you for recommending such an awesome trainer and for your tips on using it! I have a question. When I am able to recognize all diatonic tones in any octave and in random keys (with 90%+ accuracy), how should I apply the given chromatic strategies? Should I at the beginning set only the C key and 1 octave, or should I pursue random keys and the large tone range? I think when there is only 1 key and 1 octave, it is easy just to remember the sounds and don’t get the actual personalities of the tones. What do you think? You are right. When you limit your sessions to 1 key and 1 octave only, it is (somewhat) easy to remember the sounds. But, while it may feel like “cheating” this is a good thing, too. Because those characteristics are getting picked up by you at the same time – whether you want to or not. Let’s say you have mastered the diatonic notes and now you are adding a single chromatic, e.g. the minor 3rd. That note will stick out and you’ll know that it’s the minor 3rd. You are still hearing that minor 3rd note characteristic and you are attaching the correct label to it in your mind. That’s a powerful way of programming your mind. Don’t underestimate it. 1) You could stay in 1 key/1 octave until you’ve added all the individual chromatics one by one, done the note pairs, etc… and you score in the ca. 90%+ range for a couple of days in a row. Then you add the additional octaves first. Once that doesn’t trip you up, you move back to 1 octave only, but add the random keys. And finally, it’s all octaves plus random keys simultaneously. 2) For every individual chromatic or note comparison exercise you add the additional octaves followed by random keys options and the all octaves/random keys combo before focusing on the next note characteristic where you start in the single octave again. Followed by the additional octaves, then just the random keys in 1 octave and finally the combo again. Both approaches are valid and work. It somewhat boils down to personal taste. In my experience the most important thing to look out for and to avoid is: overwhelm. If you get stuck, it’s better to take a step back. No shame in that. Working on the fundamentals is always a good idea and it’s definitely better than to get de-motivated and quit. Serg, I hope this answers your questions. Thank you very much for your detailed comment and lots of extremely useful suggestions!! !